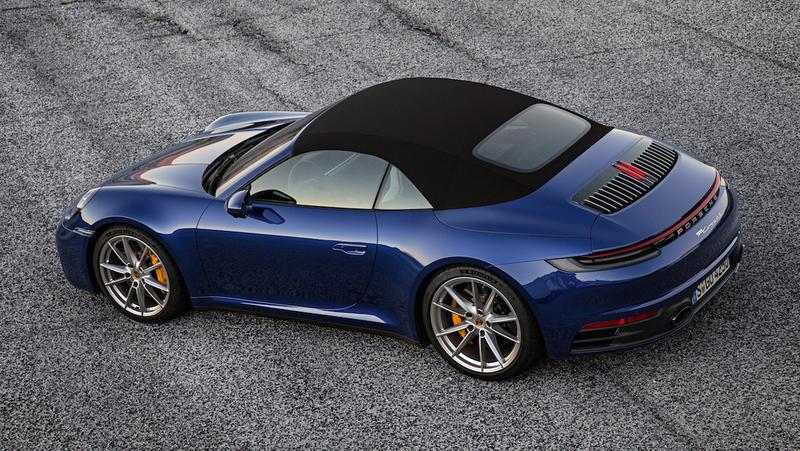 Topline: The newest variant of the 992-generation Porsche 911 is the just-unveiled, soft-top 911 Cabriolet in rear-wheel drive Carrera S and all-wheel-drive Carrera 4S. 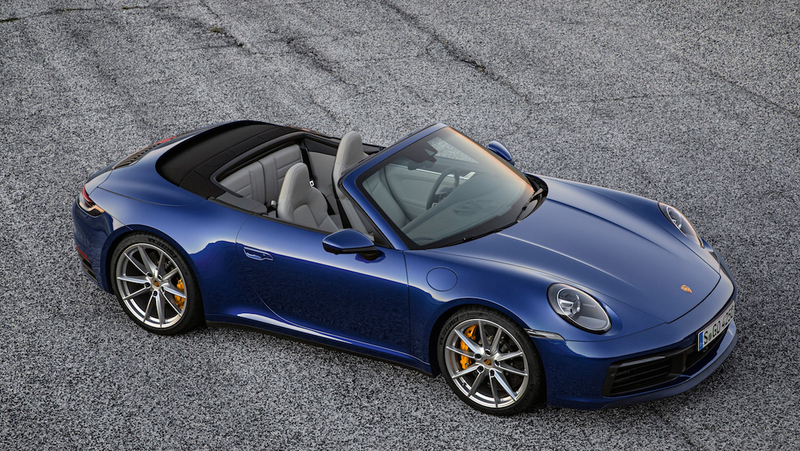 What's New: Like its hard-top sister unveiled at the 2018 Los Angeles Auto Show, the 2020 911 Cabriolet has been designed to resemble older 911s even more despite its larger size. One such aesthetic change is a longer nose and a pronounced indent under the windscreen, a nod to a feature characteristic of older models. While the 2020 911 seems noticeably wider, it's only been stretched by 1.77 inches in the front, and the rear is no wider than the previous-gen Carrera 4 and GTS models. This extra girth accommodates larger 20-inch wheels in the front and 21-inch in the back. While the 31-miles-per-hour maximum cruising speed for operating the folding soft top remains the same from previous years, it will now open or close in just 12 seconds thanks to a new hydraulic system. A new electric wind deflector has also been added to protect your neck against nasty winds while the top is down. As with the coupe variant, the 2020 911 Cabriolet's 3.0-liter turbocharged flat-six engine has been tweaked and now makes 443 horsepower and 390 pound-feet of torque. With the all-new eight-speed PDK dual-clutch transmission equipped (a manual is due later this year), the rear-drive Carrera S Cab is now capable of reaching 60 mph in 3.7 seconds and a top speed of 190 mph, while its all-wheel-drive twin takes just 3.6 seconds to get to 60 mph on the way to its top speed of 188 mph. The Sport Chrono package, optional but a must-have, sheds a further 0.2 seconds off the 0-60 mph time for both cars. For the first time ever, Porsche Active Suspension Management (PASM), Stuttgart's beloved sports damping system, is available in the new 911 Cabriolet. PASM stiffens the 911 Cab's springs, tightens its sway bars, and lowers the ride height by 0.39 inches, which Porsche says will actually improve ride quality and distribute weight better. New interior and assist features are the same as in the new 911 coupe, but here's a refresher of what you'll find in the new 992: The cockpit has been cleaned up substantially, replacing busy gauge clusters and patches of buttons with two digital displays and a simple row of switches. Wet Mode is a new standard assist system that detects water on the road ahead and adjusts the anti-lock brake and stability management systems to counteract any loss of traction. An optional Night Vision Assist provides a thermal-imaging camera for night-time canyon drives and post-dinner parking lot crawls. 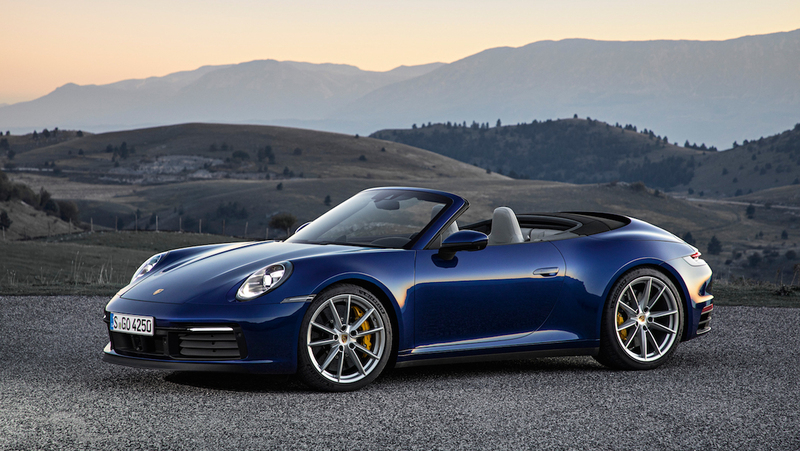 What You Need to Know: The 2020 911 Carrera S Cabriolet will start at $126,100 and the 4S Cabriolet at $133,400, excluding a $1,250 delivery fee and the laundry list of options buyers are expected to add. Both can be ordered now and will arrive at U.S. dealerships at the tail end of summer. Porsche still hasn't released any information about an upcoming Targa, Turbo, and GT3 variants, but considering the time between the Coupe and Cabriolet announcements, expect these to be rolled out in the next few months. Porsche built just 300 coupe and 200 cabriolet special editions to celebrate the 911's 25th year of production.